There are a variety of bolts that KDK produces. The diameters of the bolts can range from ½ inc to 3 ½ inches in diameter. The length can range from 3 1/2 inches to 38 inches. 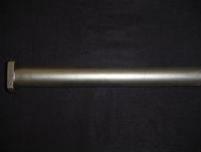 KDK has made many different dies that can be adapted for your bolt needs. Heat treating and sandblasting services are also available. This can aid in the appearance of the bolts and can bring the bolts to the desired hardness. Threading is also completed on bolts to the desired US or metric thread specification. Testing of threads is routinely done in the manufacturing process to ensure quality threading. Thread protectors can also be used in order to prevent the bolts from being damaged in shipping. Plating specifications are also completed for our customers. Bolts can be specified to different grades giving them a particular strength or hardness depending upon the application. 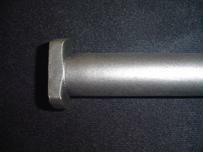 The forgings process adds strength to the steel bar as opposed to castings that can sometimes be used. Improved grain flow which is achieved as a result of this process provides strength that can be viewed from a microscope. 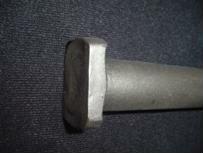 Depending on your requirements, KDK Forging will make a custom die for your forging needs. Please send us a copy of your drawing and we will be happy to send a quote to you. KDK has produced Stainless Steel and Carbon Steel bolts of all different shapes and sizes for over 40 years. Leading companies that rely on quality bolts have chosen KDK as their forging supplier. KDK bolts are used in many industries including these: automotive, off-highway, agriculture equipment, food preparation and industrial tools.